Oahu, eat your Korean taco heart out. Your Eat Gogi food truck bounced islands and is now on Maui. At the end of July I recognized Eat Gogi’s colorful truck right away on the corner of Kahului Beach Road and Kaahumanu Avenue. The shiny chrome details, hyper-styled black and red menu, images of its Korean anime mascot and super-sized spicy pork taco photo banner gave it away instantly. Not to mention the massive “Chee Hooo” on the back. The truck’s crew told me it only took two stand up paddle boards and a couple of canoe escorts to make the ocean crossing from Oahu to Maui. Nobody got seasick, and the sharks seemed to love the short rib tacos. But the trip was so traumatizing that the truck has decided to stay on Maui. This is good news because editor Anthony Pignataro and I have lately been pining away for Korean tacos; in fact, we’ve been scheming to convince a chef or two to add them to their menus. 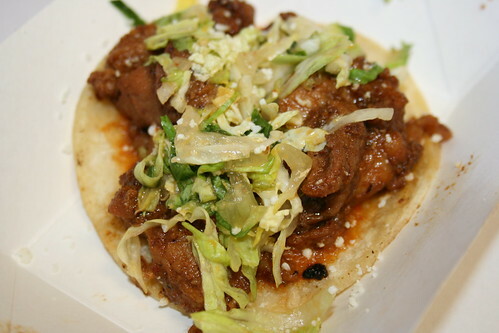 What’s the big deal about Korean tacos? You take deliciously seasoned Korean-style barbecued meat–short rib, spicy pork or chicken–then put it in two small corn tortillas and top it with kim chee. These are serious Scooby snacks at just $2 each. They also offer tofu for the meat-challenged. For my inaugural visit to their Kahului roadside location, I also ordered a Gogi Dog. 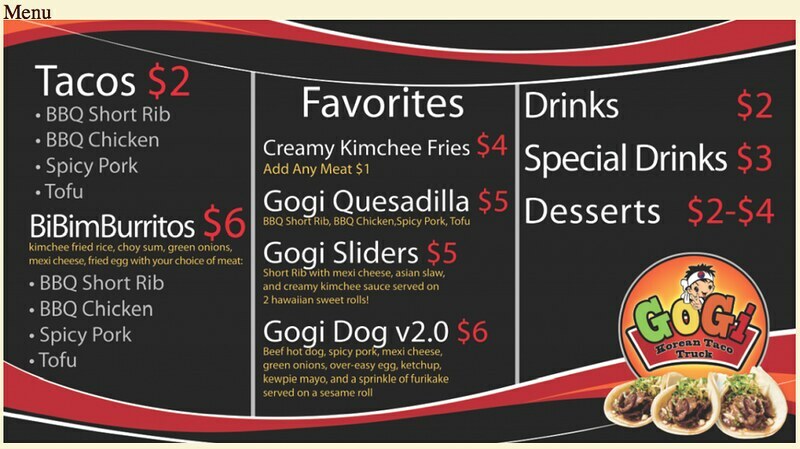 Not for faint of heart (literally or figuratively), the Gogi Dog is an American/Korean fusion classic. 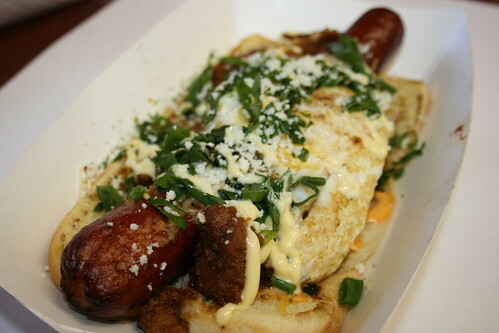 They start with the giant all-beef dog, then top it with spicy pork and an over-easy fried egg. They place all that in a toasted sesame seed bun, which also holds ketchup, furikake, spicy kewpie mayo and a sprinkling of Mexican cheese and diced green onions. It’s so good, and a bargain at $6. The Bimbap burrito is another of Eat Gogi’s take on fusion fantasy. Here, a tortilla holds Korean fried rice, choi sum, a fried egg and your choice of meat, along with Mexi cheese and green onions. There’s also a slider on their menu, and creamy kim chee fries. It almost goes without saying that you can add meat to your fries for a couple bucks more. The truck has lately been parked in the parking lot of the Maui Home Design Center, across the street from Sears at the Kaahumanu Center in Kahului. They show up around noon and stay until they sell out of everything (which usually only takes a couple hours). 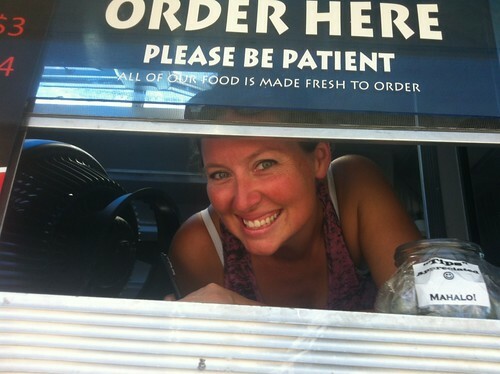 Food Trucks are Gypsy restaurants–you never know where they will show up, so it’s important to stay connected to their travels via their twitter feed. 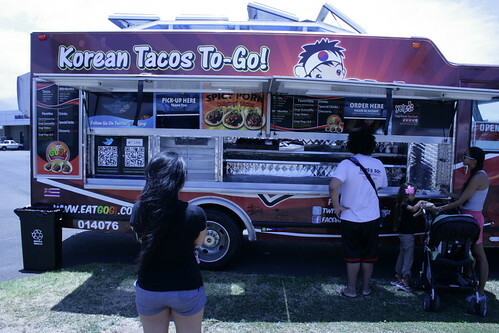 Of course, then you have to prepare yourself to receive heartbreaking updates like the July 31 message sent at 1:50pm: “Korean Taco Truck @EatGogi Mahalo K’lui peeps! No mas!! We’re out of everything! Jes, everything! Be back fri lunch same place Maui Home Design Center parking lot.” But if you send out messages like, “Gogi Dog emergency, where and when today?” the @Eatgogi crew is pretty good about letting you know the next time you can get their food. It happens fast, so for your best bite get their quickly before they run out of your favorites. They also carry ice cold sodas and water, and have a little area for you to wrap up your food up in tin foil if you aren’t planning to devour everything right then and there. the more it gives rise for research-backed supplements to succeed. and hits from dys past for the older generations.